Few things make me happier than coming home to a beautiful fresh floral arrangement. Whether it's a bouquet from my hubby, a vase filled with flowers I picked up while at the supermarket or just a simple bunch of fresh clippings from the yard. A fresh floral arrangement brings life and energy to the home and makes any space feel special. 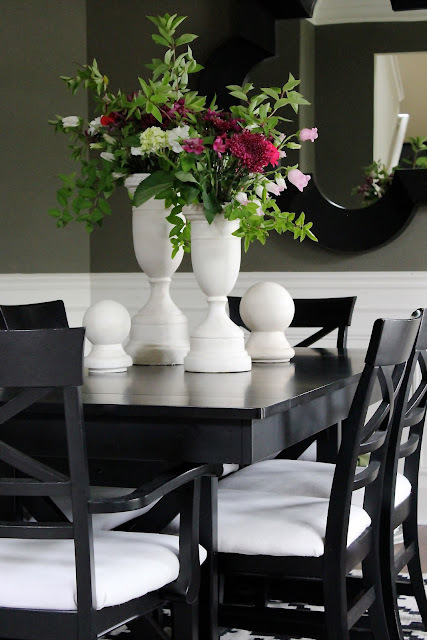 My favorite place to display fresh flowers is in our dining room. It's the first space you see upon entering the foyer. 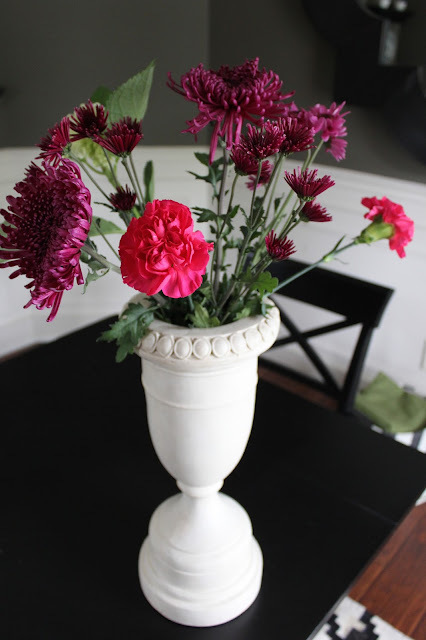 This week, I created what has to be my favorite fresh floral centerpiece ever for our dining room table. 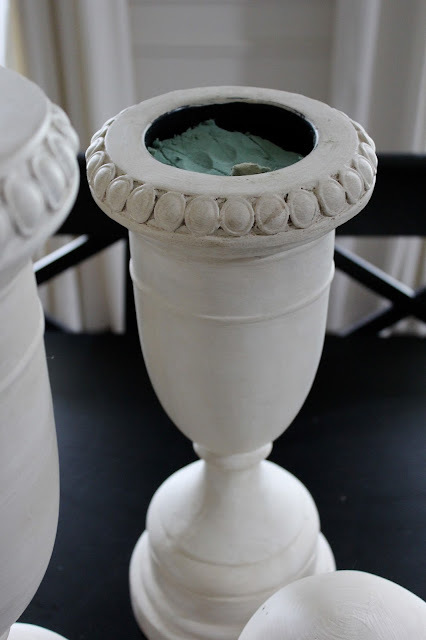 It started with a pair of Outdoor Covered Pillar Candleholders (Pawn Covered Pillar Candleholders from Bombay. I used one large and small. They are sold separately and available at Kolhs). These gorgeous candle holders are actually intended for outdoor use, but when I saw them I immediately pictured them inside on our table. Merchandise that is intended for outdoor use is usually large in scale. When brought inside, pieces like this make a big statement. Especially in a small space like my dining room. 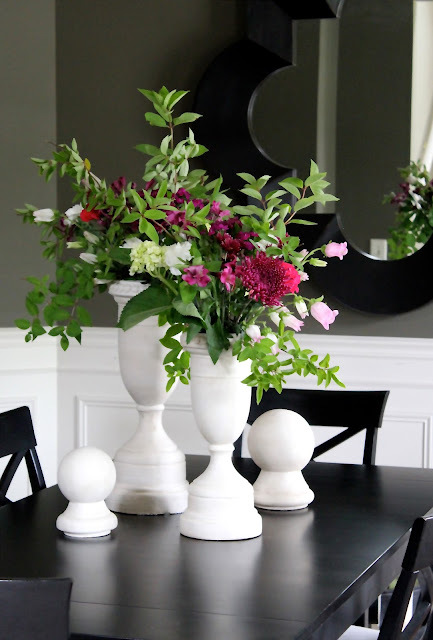 They look really cool all on their own, but I decided to use them as vases to create an inexpensive, but quite impressive fresh floral centerpiece. The tops are removable and the inside where the candle is supposed to go can easily be used as a vessel. I grabbed two bouquets of flowers from the supermarket and a package of wet foam. I cut the foam in half, wet it and stuck one half in each statue. Then, I trimmed the flowers down and stuck them in the foam one at a time. I made sure they were evenly spaced and coming out at all different angles. 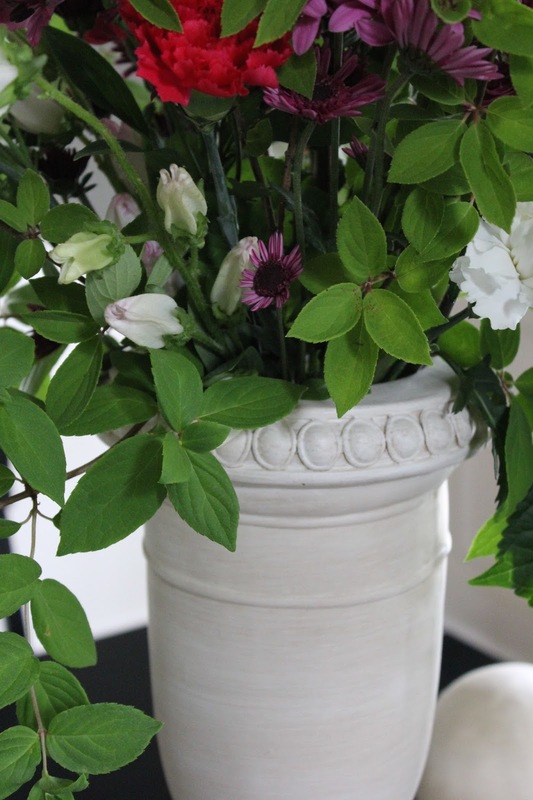 After placing the flowers in the vase, there were large gaps and empty areas that needed filling. I grabbed my hedge clippers and headed outside to the front yard. I clipped a few stems from my hydrangea and brought them inside. I used the hydrangea to fill in the areas that looked bare. Then, using a few extra long stems, I gave the arrangements a little height by sticking them in the top. I stuck a few curved stems in the bottom for a cascading effect. The round statue tops look really cool sitting on the table next to the arrangement and create a cool vignette style centerpiece. Once the flowers die, I can either refresh the arrangement with a new pack of grocery store flowers and more yard clippings, or use them as candle holders, or simply leave the statues empty. 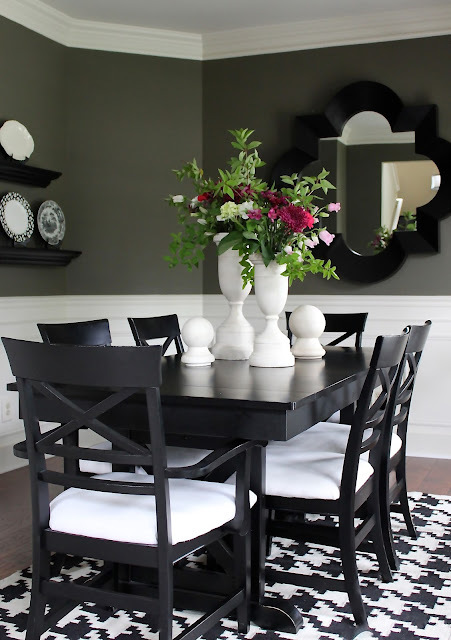 Either way, I have a large, eye-catching centerpiece that anchors the dining room table. The Pawn Candle Holders were designed in Michigan and distributed by a Michigan based family business which has been based here for over 50 years. Since I am smitten with the mitten, it really makes me happy to know they were designed and distributed locally. Here is a link where these candleholders and other Bombay outdoor furnishings and accessories are available at Kohls. *I received the Pawn Candleholders free of charge to facilitate this post. Beautiful!! You have such a great style Sarah!